KEITH'S WARGAMING BLOG. 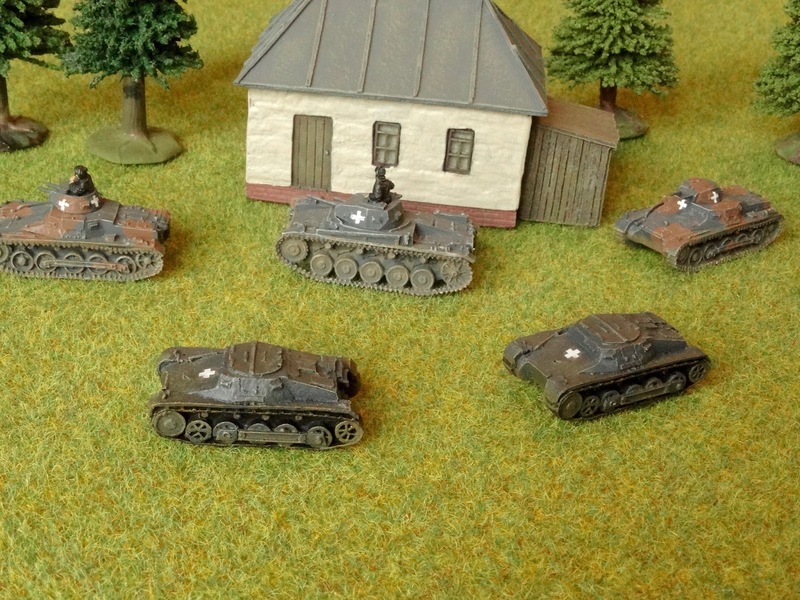 This blog has been created to share my exploits in the hobby of wargaming. I game in the WW2, Seven Years War and Ancient periods. The blog also contains a few details of my book 'Airborne Armour'. Please don't quit the site without leaving a comment, even if not related to a specific post. 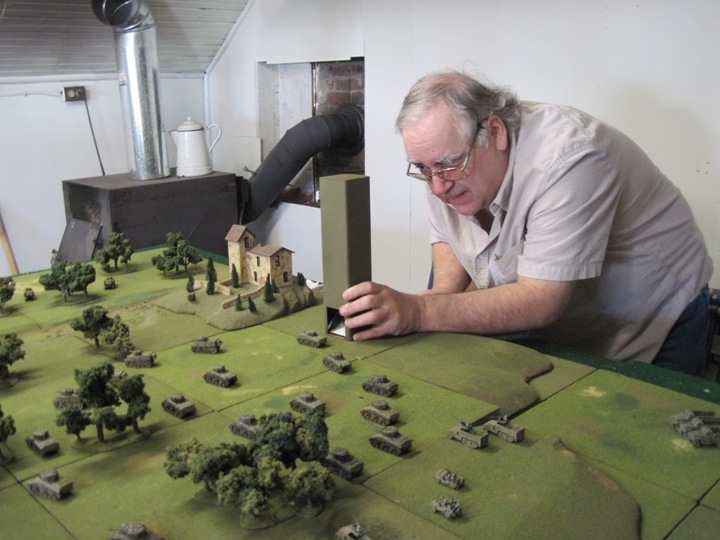 Most wargamers have something interesting to say about the hobby! Another good reason for buying Wargames, Soldiers & Strategy 86 (see previous post) was the discovery of Gaming Models, a small-scale manufacturer in the U.S. doing 15mm resin models of WW2 vehicles. 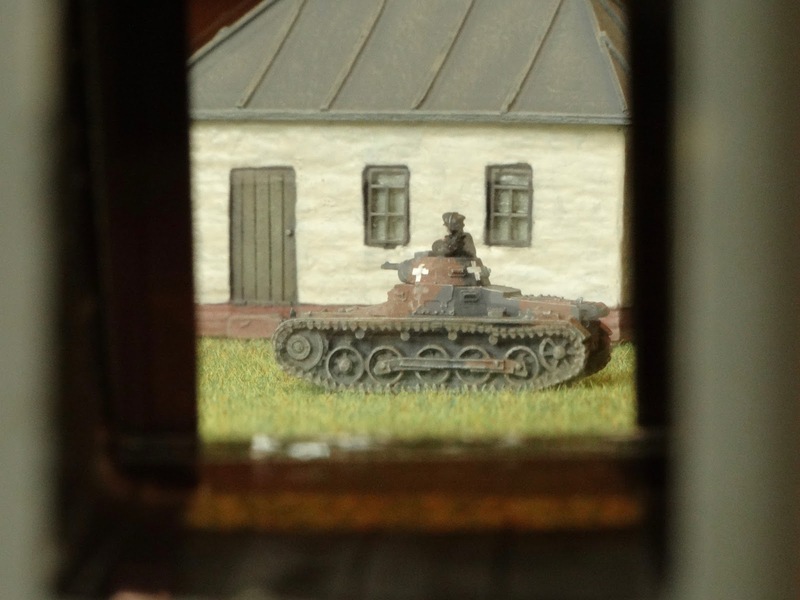 To my delight, they did a model of the Kfz.13 armoured car, which I have been pining for for some time as the final vehicle I really wanted to add to my Poland 1939 collection. For a company I had never heard of, Gaming Models do a surprisingly extensive range, often including vehicles not available elsewhere. 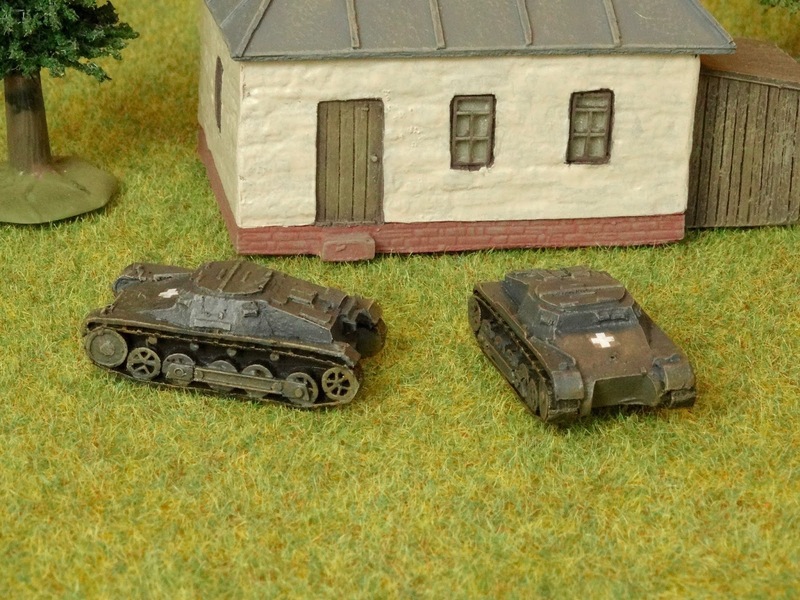 The models can be purchased unpainted, undercoated, or 'table ready' with a basic paint job. The cost per model is a standard $5.00. The models are very much 'wargames standard', and probably wouldn't please a dedicated modeller, but I found they were fine for the wargames table. 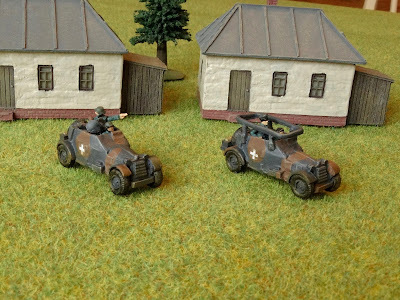 To be honest, the painting standard of the 'painted' models was a bit basic even by my standards, so I opted for undercoated vehicles which I finished off myself. 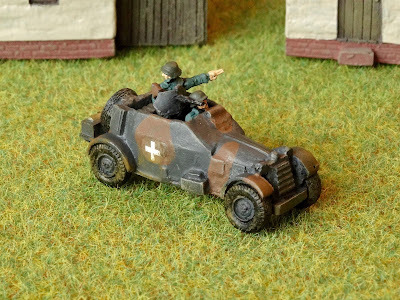 I bought a couple of Kfz.13s, a Kfz.14 radio vehicle and two Munitionspanzer Is, the latter being the kind of thing that can be very useful when playing Battlegroup Blitzkrieg, and which are also not available elsewhere in 15mm (to my knowledge). The photos below will tell you most of what you need to know about the models themselves. Generally casting is good, although the detail in the models can lack the crispness most of us have come to expect these days. One of the Munitionspanzers had a bit of a problem with pinholes in the resin - I managed to fill some of them but doing so is fiddly and at wargames ranges you probably won't notice those that remain. You will also have to find your own crew figures - I managed to dig out some old metal and plastic figures that could be squeezed in with a little surgery. The munitionspanzers compared to Skytrex Pz.Is and Pz.IIs. They fit in very well. Whilst on the Gaming Models sight I found something else I couldn't resist - they do a wargamers' periscope for just $15. 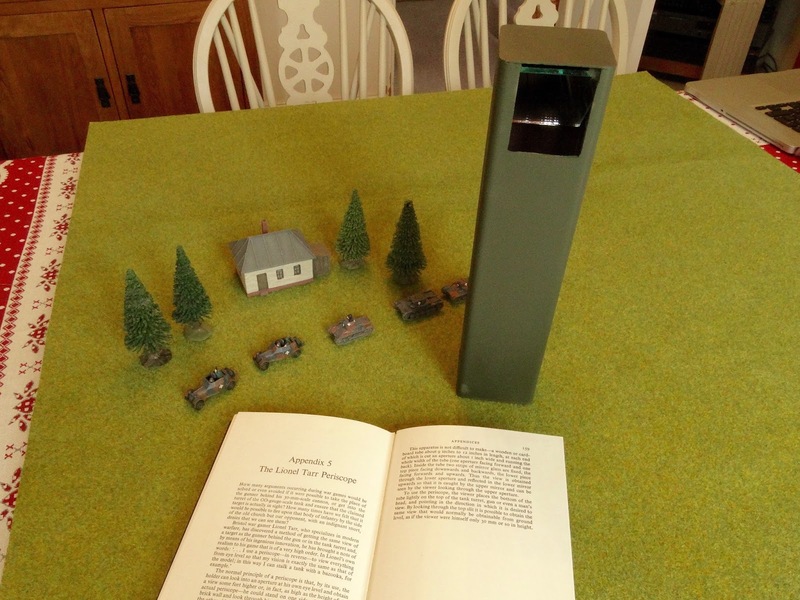 I have wanted one of these since I first heard The Lionel Tarr Periscope described in Donald Featherstone's War Games, but making one myself always seemed likely to end in tears. Mr Tarr recommended using a cardboard tube 9-12 inches in length, and I am happy to say that the Gaming Models 'terrain scope' is 11 inches high, and made from a solid plastic square-section tube which comes in a nice shade of olive/khaki. This is just the kind of whimsical accessory that perfectly suits our hobby, and will be fun to wield during games with friends. Who knows, it might even come in useful occasionally! The odd LOS dispute does come up in my Battlegroup Blitzkrieg games. I should also add that Craig from Gaming Models let me have the periscope for free, as a kind of 'welcome to Gaming Models' gift. Thank you Craig, that was very generous. Target in sight! The view through the periscope. Service from Craig is exceptional and very friendly. I had my items from the U.S. in two weeks, and paid $16 postage and packing on a $25 order, which I thought was reasonable. All in all, if you're gaming WW2 in 15mm the Gaming Models site is very worthy of your attention. Nice vehicles. Just the style of period I enjoy. Good to see the Lionel Tarr periscope making a comeback. Nice review. 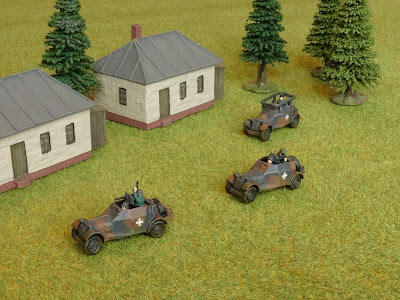 I'm a big fan of Craig's Gaming Models, and proud to say I own quite a bit of his miniatures (Late war Europe and Pacific). If there are any specific models you are looking for, be sure to drop him a line as he is open to suggestions. This is an example of the best sort of Osprey - where a fresh perspective is given to a subject by a well-informed author. Some may conclude that in rehabilitating the Prussians the author takes his revisionism a little too far. 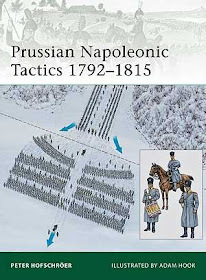 However, there is much solid information here on organisation and tactics, illustrated with some very nice explanatory artwork. For me, it was well worth the price. I was born in 1957, and am married with 3 children. I have been interested in military history for as long as I can remember, and have been wargaming since I was a teenager. I work as an Air Traffic Controller.